Dr. Kimberly Terrell holds an eastern hellbender caught during a stream survey in southwest Virginia. Photo by JD Kleopfer. ​Eastern hellbenders are one of the largest amphibians on the planet. They require cool, fast flowing streams and rivers with high levels of oxygen to breathe. 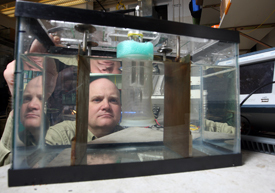 Changes in temperature can affect not only levels of dissolved oxygen in the water, but may invoke changes to the hellbender’s immune system as well. 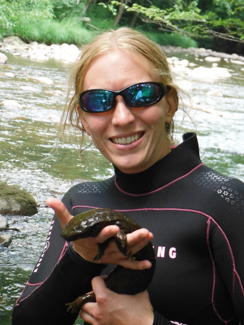 In this podcast, our guest host, Emily McCallen, with the Department of Forestry and Natural Resources, will be interviewing Dr. Kimberly Terrell about how variability in water temperatures may increase immune function in these giant salamanders. Asian carp, which consist of four species native to Asia, were introduced to help with the production of aquaculture ponds. Two species, however, have become invasive throughout much of the eastern United States. Silver and bighead carp are becoming so numerous that they may be displacing our native species and altering the aquatic ecosystem. Dr. Goforth will be discussing some of his current research on tracking carp movements and methods that can potentially control population numbers. To listen to the podcast, visit Invasion of the Carp. ​How big of a threat are invasive species to our environment? The answer to that question — a big problem! A recent analysis ranked invasive species second only to habitat loss. Threats that invasive species pose can take many forms: ecological threats such as the exclusion of native species or changes to ecosystem processes as well as large economic costs resulting in the loss of forage or timber quality. In Part II of the mini-series on Invasive species, our host, Rod Williams, will be interviewing two Purdue scientists that study the effects of invasive plants and how they affect our ecosystems. 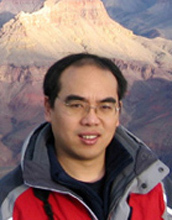 Dr. Songlin Fei and Dr. Mike Jenkins are both associate professors in the Department of Forestry and Natural Resources. Drs. Fei and Jenkins will discuss how the level of invasiveness relates to the current distributions of invasive plants and what happens when you remove invasives from the environment. They will also point out some of the most problematic invasive species and which regions in the U.S. are current invasion hot spots. Listen to the podcast: Invasive Species Part II: Threat To Our Environment. Lenny Farlee pointing out invasive Jet Bead at a Purdue Extension invasive plant training program. If you have ever taken a walk through a forest, a woodland or a park, then you have likely encountered exotics plants. What may be difficult to distinguish, however, is whether or not those exotic plants are invasive. Unfortunately, most of us think that if it’s green, it’s good, but being green could be misleading. Invasive exotic plants are consuming growing space at an alarming rate and replacing our native species. These changes in plant species can have dramatic impacts, both economically and ecologically, to landowners and the ecosystem. Invasive species are such a problem that we are devoting an entire Podcast series to this topic. In Part I of the Got Nature? Podcast mini-series on Invasive species, our host, Rod Williams, will be interviewing Lenny Farlee, an extension forester with the Hardwood Tree Improvement and Regeneration Center at Purdue University. Lenny will be the first expert in a series of podcasts devoted to the topic of invasive species, both terrestrial and aquatic. Lenny will be introducing our listeners to the topic of invasive species, identifying which species pose the greatest threats to the woodlands within Indiana and discussing the ecological and economic impacts that invasive plants pose to landowners. This podcast will also highlight methods that can be used to manage woodlands infested with invasive plants. 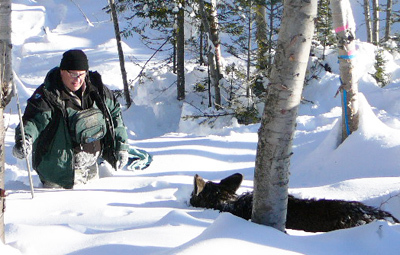 Wildlife scientists use a variety of techniques and tools to study the ecology of wild animals. Biologists regularly rely on traps or nets to capture, mark and release research animals. Some species, however, are difficult to sample or perhaps endangered, so handling the animals is not the best option to answer research questions. In these cases, scientists are now relying on new technologies to sample the environment where the animals live; that is, they sample DNA. Listen to the latest Got Nature? podcast on Using DNA Animals Leave Behind to learn from Dr. Stephen Spear of The Orianne Society about how he can study the ecology of rare and endangered animals simply by testing water from the streams where animals live. 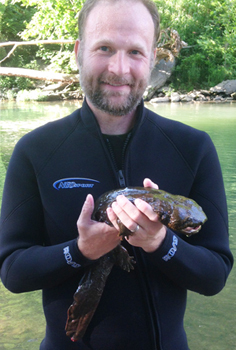 The podcast will highlight Dr. Spear’s research on the genetics of North America’s largest amphibian, the eastern hellbender. Dr. Spear is interviewed by a special guest host, Dr. Steve Kimble. Planting food plots is a popular activity for landowners interested in attracting wildlife for viewing or hunting. The following are answers to questions we commonly receive regarding food plots, providing basic information to consider when planning for food plots as part of a comprehensive wildlife management plan for your property. This information is intended as companion reference from the Purdue Got Nature? post on June 19, 2014. Food Plots is part of the Got Nature? Podcast series or you can listen to it on iTunes Got Nature? What is a food plot, and how important are food plots for wildlife in general? A food plot is simply an agricultural crop or forage planted to attract wildlife for observation or hunting. While food plots are readily used by wildlife, they are not necessarily needed by wildlife. When we manage wildlife habitat, we break the habitat down into four basic components. Those components are food, water, cover and space. When we assess a habitat for the needs of a particular wildlife species, we want to determine which of those basic habitat components are most limiting or in need of the most work. Food is rarely the most limiting factor for wildlife. The most limiting factors are usually cover and space. Therefore, food is usually not the first habitat component needing to be addressed on the landscape. The primary purpose of planting food plots is to meet human desires to attract wildlife, rather than a necessity for wildlife. That said, food plots can still be incorporated and managed as part of a comprehensive management plan for any property in which wildlife viewing or hunting is an objective. What are the different types of food plots? What plants you provide in a food plot is largely determined by what species of wildlife you are interested in attracting. If you are interested in attracting white-tailed deer, which is quite often the wildlife species for which most food plots are planted, plants that provide green browse throughout most of the year would be recommended. The most popular green browse plants are typically forage plants and include clovers and wheat. Other green browse options might include soybeans, alfalfa, brassicas, turnips, kale, rye, oats and triticale, among others. Wild turkeys will also use green browse plots, especially during the spring. Due to the short growth stature of green browse plots in the spring, male turkeys will often use these areas for strutting. Hen turkeys will bring broods to food plots of clover or other legumes for “bugging.” These areas are often high in insect biomass, providing an abundant and easily accessible food source for growing turkey chicks. Agricultural grains are often planted for small game wildlife, including northern bobwhites, ring-necked pheasant and eastern cottontails. Grains like milo (or sorghum), sunflowers and corn are popular for small game food plots. Eastern cottontails will also readily use green browse plots if there is dense shrubby cover close by to escape predation. Sunflowers are usually planted specifically for hunting mourning doves. Grain food plots will also attract many nongame wildlife, especially songbirds. A mature sunflower field will often be full of American goldfinches, indigo buntings, chipping sparrows and song sparrows. When should food plots be planted? When food plots should be planted depends on what plants you will be planting. Most of the agricultural grains should be planted in the spring. Typically April and May are best for spring planted grains. Exact timing for spring planting is not as critical for food plots as it is for agricultural production. For example, soybeans can be planted in late June or even early July as a food plot. Soybeans planted for food plots are usually to provide green browse through the summer rather than bean production for harvest. Although late planted soybeans may not grow as optimal as earlier planted beans, they can still enhance the nutritional quality of summer forage for deer. Green browse plots for winter forage, including wheat and clovers, are usually planted in late summer through early fall. Clovers can also be planted in late winter or early spring. Food plots vary in their expense to establish. Much of the expense depends on what you plant, equipment costs, herbicides and soil amendments. The expense really boils down to how much effort you want to put in the food plot and how successful you want it to be. Seed costs vary considerably. Some conservation organizations, like Quail Forever and Pheasants Forever, offer free seed for its members to plant grain food plots. You might check with a local agricultural seed dealer or Ag co-op for availability of old seed. Older seed is not usually sold for agricultural production, and seed dealers may be willing to make a deal to get it out of their storage facilities. Some seed suppliers can provide additional services such as mixing your seed order for a small fee to save you time in the field. Of course, there are also the name brand seed varieties available through many sporting goods stores; however, they are usually much more expensive. Equipment can be a considerable expense for planting food plots. Small tractors and utility vehicles can be quite expensive alone. Then you will need the implements to do the job, such as discs, planters, sprayers and possibly tillers or cultivators. If you lease part of your land for farming, you might be able to negotiate food plot work as part of the contract. Some Soil and Water Conservation Districts have implements, especially grain drills, available for loan at a small fee or deposit. Some equipment can be rented from rental supply companies. There are also individuals who specialize in food plot establishment and other habitat management projects available for hire. Expenses associated with food plot preparation should be considered during the planning process. You will likely need to control undesirable vegetation with herbicides. Fertilizer may be necessary, and fertilizer costs fluctuate yearly. You may even have to consider exclusion of wildlife during the establishment phase, especially where deer are extremely abundant. Fencing for exclusion can be a considerable cost. What are the basic steps in establishing a food plot? The first step in food plot planning is to consider your objectives for having a food plot. Are you a hunter wanting to attract game to increase your hunting success? Are you interested in bringing wildlife closer to you and your family for viewing and enjoying? Once you have determined your objectives, you need to determine the location(s). If you are planting for viewing only, where do you intend to view from? A back deck or perhaps from your living room or kitchen with large windows? You will need to consider the movement patterns of wildlife through the landscape, especially if hunting is your objective. Wildlife are more likely to utilize food plots when they are planted in areas through which they are already moving. It can be difficult to attract wildlife to an area they do not otherwise occupy unless you intend to address other habitat needs, especially cover requirements. If you are hunting, you will also want to consider wind patterns that will impact your movement into and out of the food plot during hunting. Providing multiple food plots increases hunting opportunities. Site preparation is determined by several factors, including the amount of undesirable vegetation you will have to treat with herbicides, soil tests and planting method. If the site you have selected contains a large amount of herbaceous vegetation, you will want to consider using herbicide to kill as much of the competing vegetation as possible. Which herbicide needed depends on the nature of the plants you will control. A general herbicide most people use is glyphosate. If you have mostly grass to control, then a grass-specific herbicide can be used. If you need to control mostly broad-leaved plants, then a broad-leaf specific herbicide can be used. It is critical that before you use any herbicide, you read and follow all label directions. A soil fertility test should be conducted for each food plot in order to determine if any of the essential soil elements are lacking and in need of amendment. The basic test will provide information on soil pH, plus the amounts of nitrogen, phosphorus, potassium and lime (calcium) that should be added. The folks at your county Extension or Soil and Water Conservation offices will provide you with the information you need for soil sampling and submission for testing. After you receive the test results, it is up to you on whether you want to amend the soil as per the test recommendations. Factors to consider are cost of the amendments and the desired vigor of the crop you plant. The more vigorous the crop, the more nutritional value it will have. The planting method you choose will dictate how much soil work will be necessary. If you will be using a no-till drill, then you will be able to drill your seed directly into the soil through vegetation without disking it first. If you are using a conventional drill or broadcasting the seed, you will need to disk the soil prior to planting. If broadcasting, you will want to make another pass over the field with a cultipacker, harrow or other drag to lightly cover the broadcasted seed. Annual plants, such as agricultural grains, will need to be planted every year. You could lightly disk a field of annual grains following seed set and perhaps get a second growing season from the seed production, assuming all the seeds have not been consumed. You could also leave the field fallow the next year, which means do nothing with it and let it go without disking or spraying. Either way will result in some germination of the previous year’s seed production along with annual weeds. The annual weeds are likely to be of good value for wildlife. Invasive weeds, such as Canada thistle, should be controlled with herbicide. Keep in mind that ragweeds and foxtail, while agricultural weeds, are highly valued by wildlife who consume seeds. Other food plot plants, such as many clovers, are short-lived perennial plants and do not usually need to be planted every year. Once established, many clovers can be mowed periodically to maintain a vigorous growth. It would be beneficial to allow the perennials to produce seed to help maintain the field. Reseeding perennial plants may be necessary where browse pressure by deer is excessive. Are there negatives associated with food plots? There are not many negative impacts of food plots on wildlife. Two that could potentially impact wildlife are disease and predation. Any time you concentrate animals, you increase the risk of communicable disease transmission and predation. These negatives can be reduced through vigilant observation of your plots and habitat management. If you do notice a disease problem, then you may want to take the plot out of production for a year or two to reduce the concentration of animals. Disease transmission associated with food plots is rare. What resources are available to help with food plots? One of the best resources available for wildlife habitat management, including food plots, is your local District Wildlife Biologist from the Indiana Department of Natural Resources. The District Wildlife Biologist will be able to assist you in meeting your land management objective, especially as it relates to wildlife habitat. They will also be able to determine if your wildlife management objectives qualify for any cost share opportunities. If you are not in Indiana, your state’s natural resource management agency will also have a team of wildlife biologists dedicated to assisting landowners. Another source of information is the Cooperative Extension Service. All states have Extension Wildlife Specialists housed within a Land Grant university that can provide you with information on managing wildlife habitat. Your county Extension Educator/Agent will also be able to provide you with information. The University of Tennessee Extension Service has several food plot resources available that are applicable throughout the eastern United States, including the book, A Guide to Successful Wildlife Food Plots: Blending Science with Common Sense (8MB pdf). For more resources, view Food Plots from The University of Tennessee Extension. There are many books about food plots available from online bookstores. You can also get information about food plots from non-profit conservation organizations such as Whitetail’s Unlimited, Quality Deer Management Association, Pheasants Forever, Quail Forever, Duck’s Unlimited, etc. If you use the Internet for information, look for information from organizations previously listed, from government natural resource agencies and the Cooperative Extension Service. Don’t forget to ask neighbors, friends, hunters and others with similar interests from your area. They may be experienced with planting food plots and, from my experience, enjoy talking about their experiences. They can be a wealth of knowledge, especially in regard to what will grow and what will not in your area. They may also be willing to help you with the planting of your plots! Don’t forget to check out Purdue Got Nature? Podcast: Food Plots. Unless you grew up on a farm or you were involved with 4-H as a youth, you may not know what Purdue Extension is. Extension engages citizens and stakeholder groups in a dialogue to help solve problems and improve our quality of life. 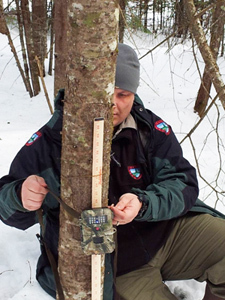 Extension Specialists within the Department of Forestry and Natural Resources at Purdue work with others in forestry, urban forestry, fisheries, community development, natural resources, wood products and wildlife. Their role is to provide these stakeholders with information to make informed decisions. However, just as important, stakeholders work with extension to develop the information and provide key insights into issues that extension should focus on. The What is Extension podcast is part of the Got Nature? podcast series. In the most recent interview, the host, Rod Williams asks Brian MacGowan, extension wildlife specialist, about the role of extension and the types of resources extension provides. Brian also provides a little bit of insight about the job of being an extension specialist at Purdue. For this and other Got Nature? podcasts, visit purdue.edu/GotNature. Purdue extension is part of the Cooperative Extension Service at land-grant universities across the United States. Extension is commemorating its 100th anniversary this year. Video: What is Purdue Extension? A new podcast series that began Thursday (June 19) connects Purdue University experts in nature and natural resources to a growing audience of people interested in the environment. The “Got Nature?” podcasts offer science-based information on a wide range of issues, presented in an unscripted, conversational interview format. They will be offered on the third Thursday of each month. In the first podcast, another Purdue Extension wildlife specialist, Rob Chapman, answers questions about food plots for wildlife. 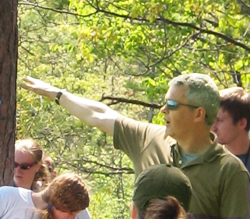 He discusses how food plots can fit within a comprehensive management approach to wildlife; steps landowners should follow when establishing food plots; which crops landowners can consider for white-tailed deer, rabbits, doves, wild turkey and other game species; tips on saving money; planting strategies; and local resources. Purdue Agriculture News . . .
Podcast – Boiler Up! for Wildlife: What is digging up my yard?